Walter Burien is the leading expert on Comprehensive Annual Financial Reports (CAFRs). Beginning in 1990, Walter began documenting how governments manipulate their books to hide public money, but reveal part of what they do in CAFRs. I discovered Walter’s work in 2012, read CAFRs for the state of California, the City of Los Angeles, and Los Angeles County, and verified his information as correct. I document those CAFRs’ information here, along with the adventure of my California Assemblyperson and State Senator’s obfuscations and eventual official statements of, “No comment” when asked to verify what I found in the state CAFR. My 23-minute interview to explain my findings is the last video of this article. I found similar fraud in San Jose’s CAFR in 2015. The bottom-line is that we live in the Orwellian economy of a debt-based “money” system, while government lords over trillions of our captured dollars with .01% oligarchs hiding ~$30 trillion in tax havens (that’s about 20-30 times the total to end all poverty on Earth forever). A leading CAFR example is California’s ~14,000 various government entities’ CAFRs have a sampled-data total estimate of $8 trillion in surplus taxpayer assets ($650,000 non-disclosed assets per household). CAFR so-called “retirement funds” currently deliver net returns of about one percent on good years, and negative returns on bad years (here, here). Better read the above paragraph twice to feel our real economic condition exposed through official CAFRs. 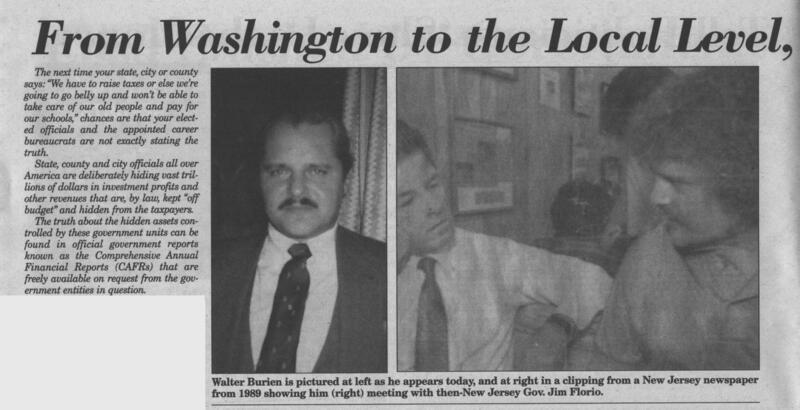 I consider Walter an American hero for intellectual integrity and moral courage to report CAFR data since 1990. He has suffered tremendous repercussions from .01% criminal financial interests he exposes. When true accounting is done, we all owe Walter trillions worth of gratitude.